What is this quintessence of dust? Hamlet. National Theatre. London. October 26. Nicholas Hynter is a wise man; eschewing hey nonny traditionalism for an entirely modern take on the Great Dane was a wise choice. This was one of the hardest, darkest Hamlet’s I have seen for a while. Not that it is particularly violent or brutal, as some productions are, but through its unflinching presentation of Denmark as a dictatorial state; secret service men litter the stage, barely leaving any one alone at any time. Polonius - not a bumbling old fool here, but a Walsinghamesque spymaster general – finds out about Ophelia and Hamlet through surveillance photographs; Images which he uses to challenge his daughter. 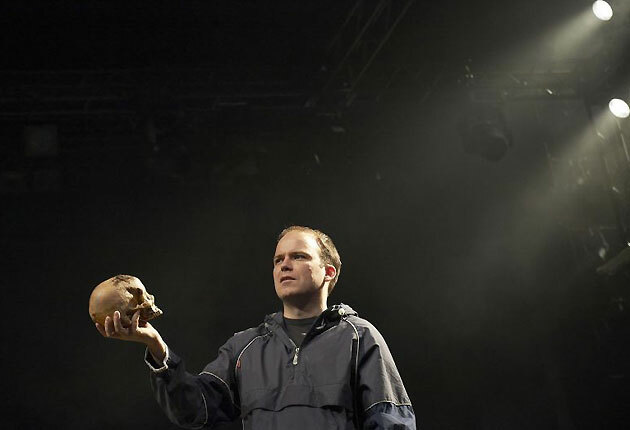 Hamlet’s moments of soliloquy are heightened by this, being the few moments he is truly alone on stage. Even his pact with the guards and Horatio to not speak of the perturbed spirit of old Hamlet is foreshortened by the appearance of 2 or 3 faceless security men. This dimension ratcheted up the tension as the play continues, placing a dark Claudius at the centre of Denmark’s malignant heart. After Patrick Stewart’s rather sympathetic Claudius last year it was a refreshing change to have a cruel, calculating, cold Claudius. This is hinted at in the first scene as Hamlet plods his papers down upon Claudius’ desk searching for permission to return to Wittenberg. Claudius glances at them, and then speaks through Hamlet to Laertes. Ouch. There were a few of these barbed, tense moments, suggestive of more than just a family at war. Moments when a palpable cringe ran through the auditorium (When Claudius tells Hamlet his grief is unmanly for one; later Hamlet’s decrying his father being dead but two hours and how cheerily his mother bears it) The political ramifications of this conflict are fully felt and as it continues the stakes are higher and the collateral damage extends. Even Ophelia it appears cannot be left to her mad ramblings (running about the place stripping off and wheeling old possessions in a shopping trolley – in a moment full of pathos she gives Laertes a toy Babar ‘for remembrance’;) At one moment she is alone on stage, rocking crying, hugging a toy, and the next three men in black appear and whisk her off. It would seem her death was ‘doubtful’ in more ways than one. So, having spent much time discussing a variety of elements in the play what of Kinnear as Hamlet? As any regular reader of these tomes will know I am a fan of old Rory (only 32 years of age but with a maturity that belies his age.) At first he appeared the disgruntled man amidst the media circus of the new coronation. However as the play progressed we saw a maturity, a defiance of all around him that made this a first class performance. His antic disposition was more a study in depression than insanity; lounging around student-like on a mattress and hiding under the duvet. Smoking his way through some of the big soliloquies, Kinnear’s Hamlet was identifiable as a modern man manipulated by a world beyond his control. This was summed up in his death, as Fortinbras -eager for publicity -puts the camera on Hamlet’s corpse and talks of the funeral rights. As the lights dim, the sounds of aircraft are heard. Resistance it would seem is futile, and despite the apparent regime change signalled by the high body count on stage, the audience were left with a faintly nihilistic vision. Hamlet it would seem was right; ‘Denmark’s a prison’. An thorough review of what sounds like a most interesting and intriguing production.